When looking for your next air conditioning unit, you’ll need to find the perfectly-suited unit for your home. A 10,000 BTU unit will be able to cover around 400 to 450 sq ft with cool air within 15 to 20 minutes. This guide will help find your next A/C unit which will be one of the best on the market if you follow our recommendations. With every A/C unit, you’ll receive a range of advantages and disadvantages, some of which are pretty obvious, while the others may be hidden between the lines. These are pros and cons that we think you should be well-acquainted with. This is probably one of the most obvious advantages to having an air conditioner. By providing your room with a constant flow of cool air, it will allow you to relax in comfort in your own home during those warmer months. Thanks to modern A/C units, you’ll be happy to know you don’t need to keep your air conditioner running throughout the night which could make your room far too cold and runs a risk of overheating. The dehumidifier will ensure that hot, damp air will be extracted and can even be set on a timer to work only at night. The higher the BTUs, the more area you can cover and cool quickly. This is fairly obvious. However, it’s still an advantage, regardless. You’ll need to be careful what size of room you are trying to cool, as if it’s too large you’ll never cool it down fast enough and you’ll potentially cause damage to the machine. With many A/Cs on the market, the noise is definitely a big problem. The accepted maximum noise level for any device is anything 50 dBZ or less, with the average unit exerting 60 or more dBZ. The noise from a louder unit will most likely keep you up or make it hard to think when you turn on a higher fan speed or mess around with temperature controls. You’ll find a variety of air conditioning units that come in a range of prices. However, most great, or even average, quality A/Cs can be pretty expensive just because of their brand. This is why you need to do a ton of research and is why we’ve made this article for you. This is without a doubt one of the most important parts of this review, the following list contains the best air conditioning units currently on the market. If you are having trouble finding anything that suits you, you’ll most likely find what you’re looking for here. 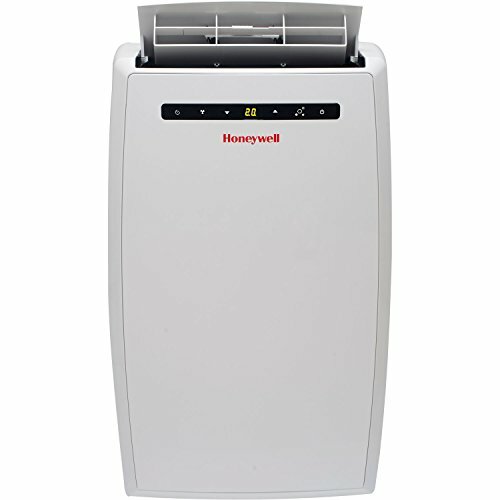 Provides Cool Air for 450 Sq. Ft.
One of the most impressive features of this A/C is that it has an EER of 12.1, meaning it’s one of the most efficient currently on the market. This rating will save you plenty of energy and tons of money in the long run. 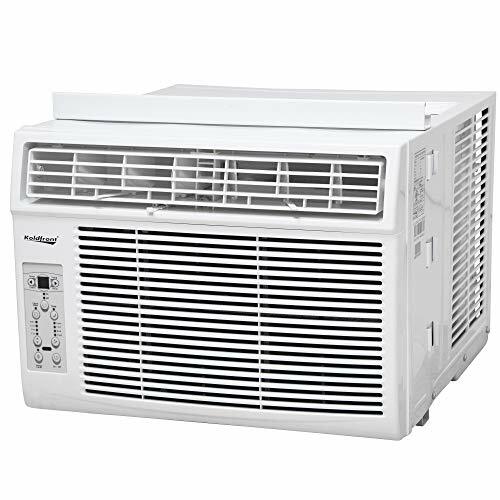 The standard for most 10,000 BTU air conditioners is that it can provide a cool air-flow for up to 450 sq. ft. and that’s exactly what you get with this device. Like many others on the market, it can dehumidify the air around you by removing up to 2.7 pints every hour. The final main feature is that it offers three cooling speeds. 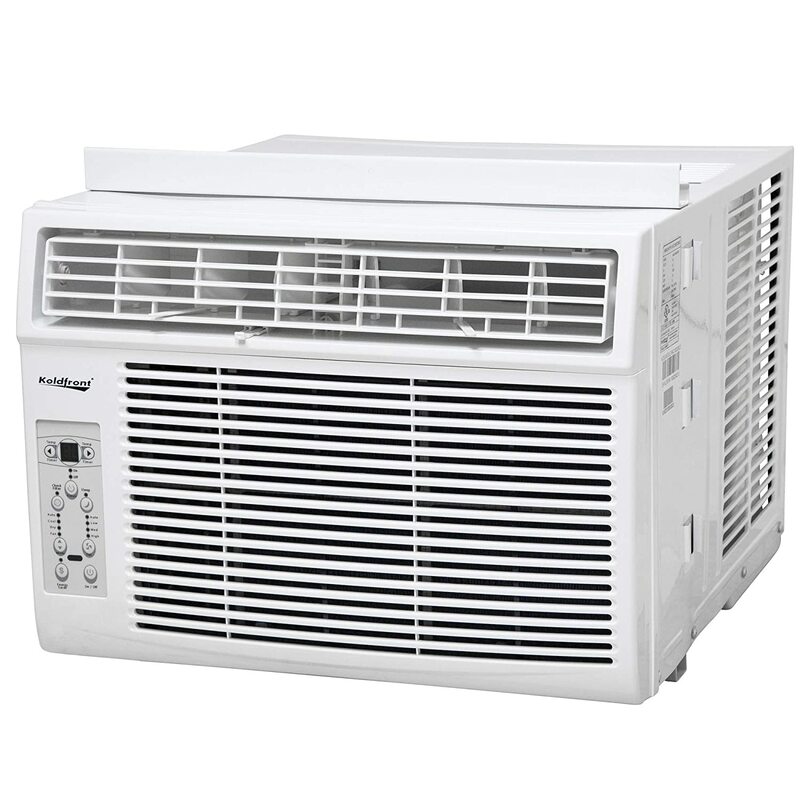 Without a doubt, this is the best air conditioner on this list. With an outstanding EER of 12.1, it offers so much in terms of saving you energy and money. It came as a surprise that it could cool an area up to 450 sq. ft., making this not only highly efficient but also effective. The standard for most top quality units is that it offers a dehumidifier and most manufacturers throw this in and hope it works. This device, however, has a fully functioning system that can extract an impressive 2.7 pints each hour. The additional features like the three different cooling speeds are also crucial if you only want a subtle change. The downsides are that there’s no continuous drain meaning you’ll need to empty the liquid manually and once you install the device it has the issue of being noisy until it adjusts itself over the first week or so. This portable unit can be controlled via a remote control that offers the ability to customize the settings like, three different fan speeds, an energy saver mode, and a 24-hour timer. The full installation kit is also included with the A/C. Another great feature is the dehumidifier which can extract up to 66 pints per day with the option for a continuous drain so you can run the function 24/7. The best portable unit out at the moment, you’ll be happy to know how convenient this product actually is. Thanks to the remote control, all of the various settings can be changed and accessed with a click of a button. The same convenience comes with the dehumidifier as it can offer a continuous drain for the 66 pints of liquid it extracts daily. Not to mention it also covers an area of around 450 sq. ft. The downside to using this air conditioner is that it’s a single hose system, meaning it will overheat easily. However, to combat the risk of overheating, the thermal protection process will kick in to automatically shut the device down. By covering an area of up to 450 sq. ft. and using the eight-way airflow, you’ll be more than happy with the even spread of cool air and steady decrease in temperature during those scorching summer months. To help make the air even more comfortable, you have access to a dehumidifier that can extract up to 2.7 pints of liquid every hour. The convenience doesn’t stop there as all your controls like the temperature, fan speed, and energy saving modes can all be controlled from the remote control provided. 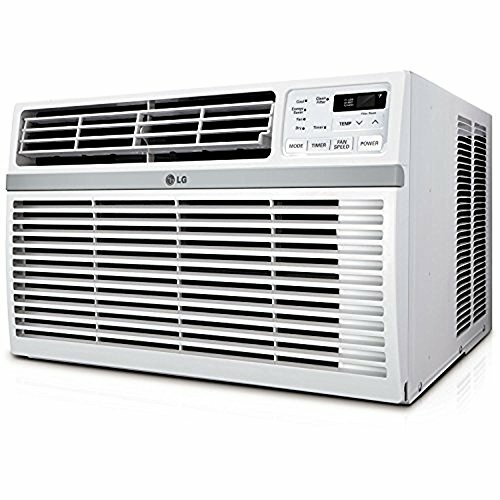 The energy efficiency rating of this product is a steady 10.9 which means your A/C will only cost an average $83 per year. It’s a surprise that this product didn’t come as the best overall window unit as the list of benefits is almost endless. Starting with a decent range of 450 sq. ft., the cooling system can offer an even spread of cold air thanks to the eight-way airflow. Along with that, all the systems can be controlled via the remote control which makes the whole process more convenient and easy for the operator. The EER sits at 10.9 which is above the standard and in that Goldilocks zone. The dehumidifier is able to extract up to 2.7 pints of liquid every hour, the only downside is that there’s no continuous drain option. Therefore, you’d need to do that manually. Covering an area up to 250 sq. 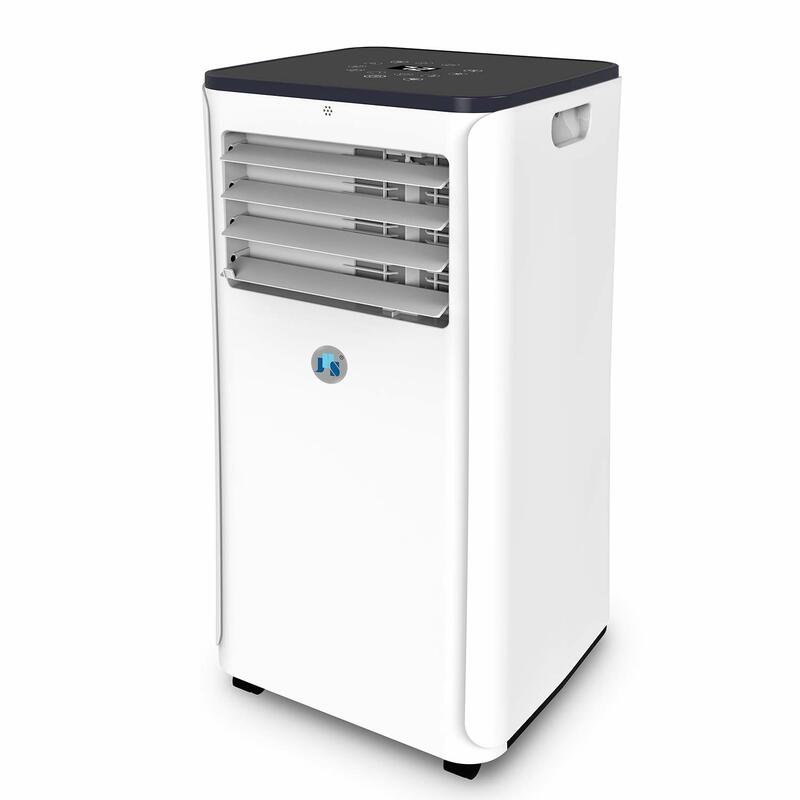 ft., this portable A/C unit has a sleek and smart design that is built to provide a steady flow of cool air that will evenly spread throughout the room. All you need to set it up is provided with the product, meaning you’ll have a simple installation. The slide-out filter can be cleaned easily with just hot water and soap, this filter will protect your home from dust, hair, and bad odors. The electronic control panel and remote control make accessing and customizing the various settings a breeze and convenient. The small features like the energy saving mode and timer are all great additions and standard for most units nowadays. The three-in-one design offers the services of a dehumidifier and a fan. It’s clear why this product was a runner up and not the overall best portable unit. Despite the downsides, there are a few upsides like the fact it offers the cooler air with a dehumidifier and fan for any situation. The easy clean filter is for convenience and limiting the dust or bad odors from entering your home. This can also be cleaned with hot water, making the cleaning process simple and fast. The smart design of this device means an even spread of cool air travels throughout the area. The multiple settings are all controlled via the remote control which adds further to the long list of convenient benefits. The downsides are still plentiful unfortunately. For example, the single hose system could increase the possibility of overheating, which isn’t great considering there’s no thermal protection. The continuous drain function for the dehumidifier is also absent from the device, meaning you’ll have to unload the liquid manually. For a 10,000 BTU device, you’d think the area it would cover would be far better than a limited 250 sq. ft., which is another improvement that could be made. With an operating area of up to 450 sq. ft., this device was an easy choice for this list. A proud aspect for this device is that it has plenty of features and settings to play around with. For example, the 24-hour timer, sleep mode, dry mode, and three separate fan speeds for any situation or weather. All of this can be controlled with the convenient remote control. One of the proudest aspects of this offering is that the energy efficiency level sits at 12.0, which is one of the highest currently on the market. The best part about buying this product is that you’ll benefit from an efficiency rating of 12.0, which is one of the best ratings possible on the market. The actual power of this device can be felt in up to 450 sq. ft. with plenty of settings and various modes like sleep mode or the timer function. All of this can be controlled by the remote control provided. The downsides to this product are that it’s rather basic and doesn’t have an effective dehumidifier. On top of that, you’ll most likely struggle to hear yourself think with the noise that comes from the product. But remember, that’s why it’s budget-friendly. This portable unit is an effective device in cooling down an area of around 400 sq. ft. and t’ll do so in the fastest time possible with thanks to various speeds and features that are available to use and customize. All of these features can be controlled from the remote that’s provided in your pack. Other parts of your kit, such as window mounts and hoses are all included for an easy and fast installation. You'll benefit greatly by using the dehumidifier which is able to absorb any damp air from your environment, extracting up to 61 pints of liquid every day. All of this cool air is carried from the outside through the hose and the warm air created by the device is carried out through the same hose. There are a few downsides to this product, such as being too basic and doesn’t provide any additional features. However, the main thing you want in is for it to do its job right. It’s safe to say that this portable unit does its job perfectly. It can operate well within a 400 sq ft area, all parts of the kit are included for easy installation and it dehumidifies up to 61 pints of liquid per day. What else could you want? It does a better job than the budget-friendly window unit. The energy efficiency rating for this device is one of the top rated as it sits at 12.0. This product will most likely save you money and energy in the long-run. It would only cost an estimated $75 each year to operate. By cooling a 450 sq. ft. area within only 15 minutes, this makes it clear why customers are so happy with their product. Other modes on this device, like the dehumidifier are also just as effective in what they offer. This dehumidifier can extract up to three pints of liquid every hour. The clean air ionizer will effectively clean out any particles and odors from the air around you. Built to clean air in your immediate area, that’s exactly what this device does. The ionizer is perfect for sifting out any impurities like dust, hair, pollen, and any bad odors from the air. The same goes for the dehumidifier that can extract three pints of liquid each hour to soften the air around you. The actual reach of the device is impressive at 450 sq. ft. All of this would use up a lot of power and the device makes sure not to waste any of it thanks to the EER of 12.0. The only downsides to using this product are that the window bracket doesn’t come with the A/C and there’s no continuous drain option for the dehumidifier meaning that it’ll need to be done manually. This modern piece of equipment can be controlled via your smartphone with the help from the user-friendly app. It’s straightforward and easy to follow. By providing a cooling area of 220 sq. ft., you’ll be able to cool most rooms within your average home. 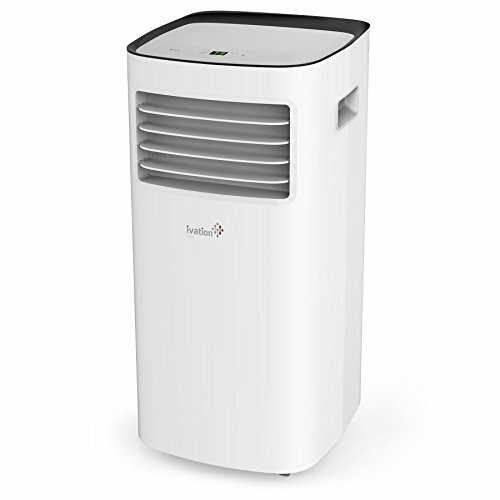 The three in one functions will provide you with not only an air conditioner, but a fan and dehumidifier that can extract up to 50.7 pints of liquid per day. The fan can be set using two speeds, meaning you choose how fast or slow you want it to cool. The smart thing about this device is that it can be controlled from an installed app. This is the only one of its kind on this list. 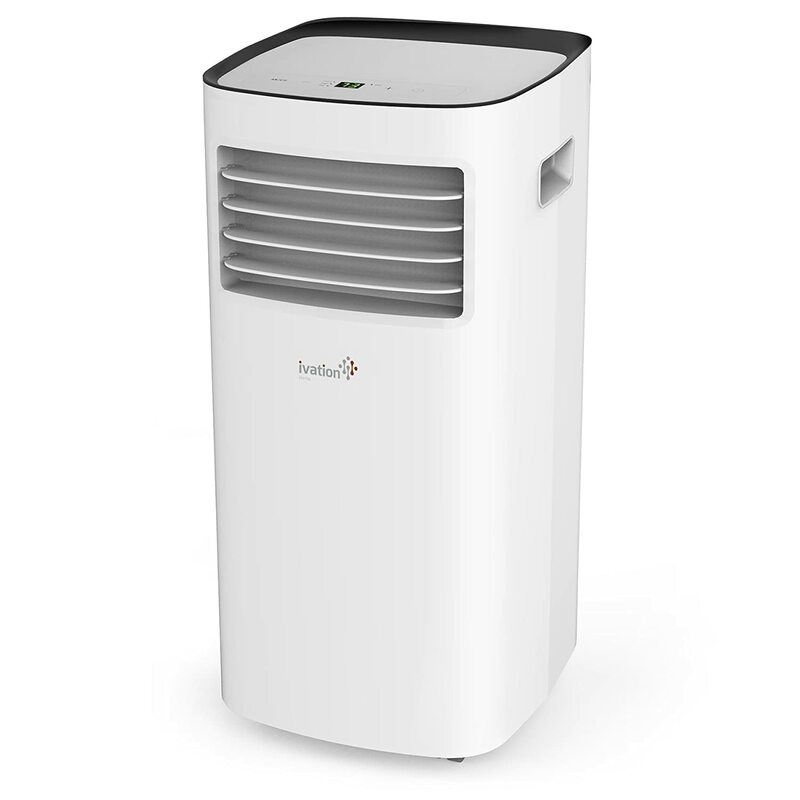 The device offers three-in-one functionality with the most impressive being the dehumidifier. Though the device is small, it can still extract up to 50.7 pints of fluid per day. The only downside to this is that it has to be drained manually as there’s no continuous drain option. The coverage area could also be improved, considering that this device should be in the range of 350-400 sq. ft., not 220 sq. ft. There are a few types of air conditioner units that should be described more in detail. They’re all fairly similar but have a few minor differences that can have a huge effect on how they operate. 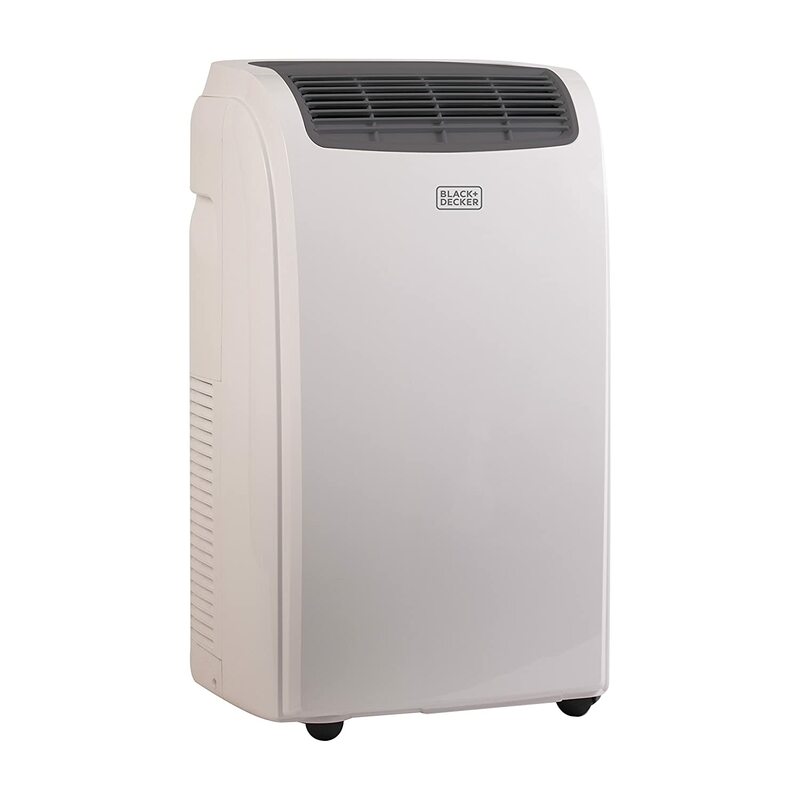 The portable air conditioner is one that can be moved around whenever and wherever you want. The only exception to this quality is that it must have a window nearby to bring in fresh, cool air and release the warm air it creates back out the window. This can be done via a single or dual hose system, the latter being more effective in keeping the heat out of your home. The single hose system tends to make devices prone to overheating. The window A/C unit is placed on your open window and held there by a window bracket. This then does the same job as the portable unit but is usually more powerful as they don’t require multiple hoses to operate effectively. Most of the time, these devices come with a full kit to ensure the unit is secured tightly and safely to the window frame. The only problem is that they take longer to set up and can’t be moved around as easily as they, on average, weigh about 40lbs. 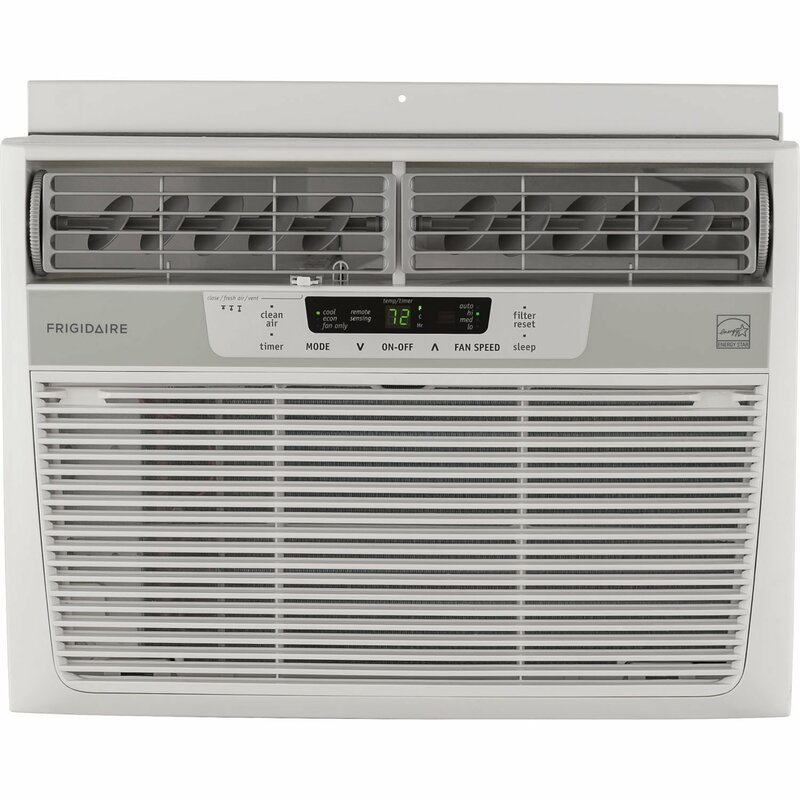 The last, and least popular, type of air conditioner is fairly similar to the window version. It has the same effectiveness in terms of air-flow. However, is even less flexible in being able to move it around. This type is installed into your wall and should be kept there permanently. This means that you’ll need multiple units in each room for guaranteed effectiveness. They also take a lot longer to install as you’d need to drill a place in your wall for your AC. This type is more hassle than what it’s worth. It’s clear that there are many different angles to research when it comes to air conditioners. You’ll want to find the best ones on the market and doing that would take a while to find all the ones with the best features. 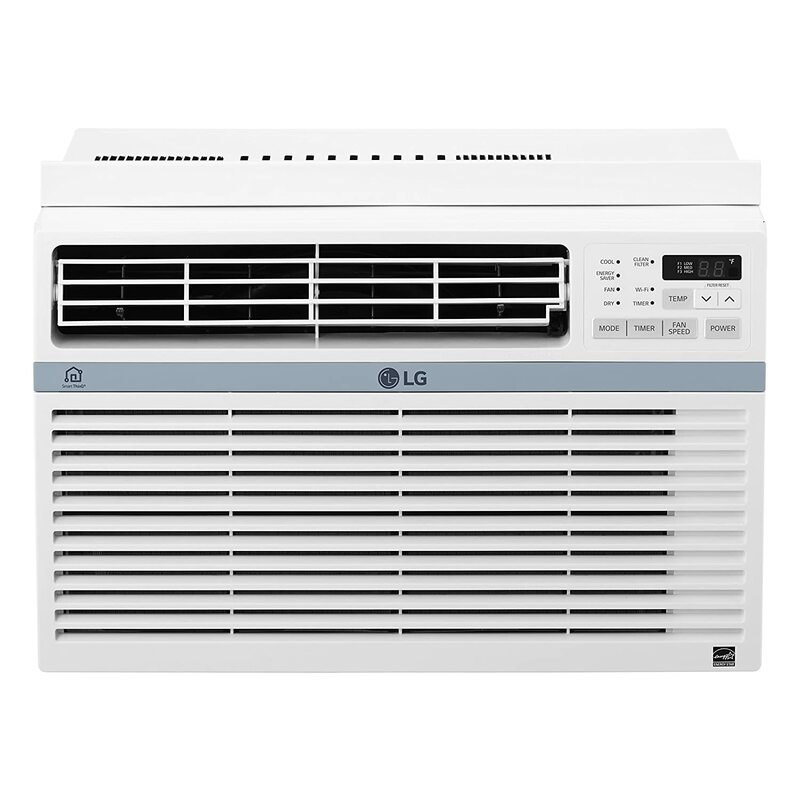 Hopefully, with our review, you’ve had some guidanc in finding your next air conditioner. This section is just as important as the main body of this article. Here, you can find all of the most asked questions and answers for those here. We hope this helps any of you that need it. 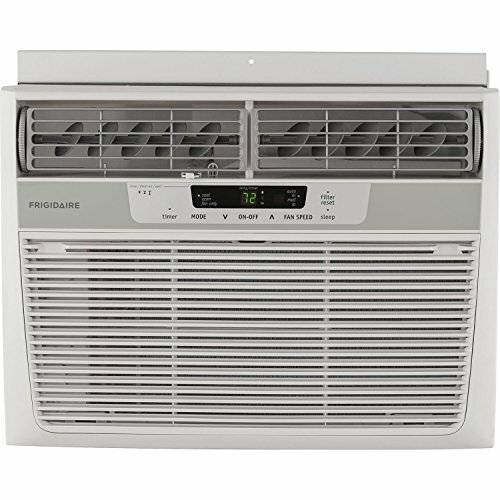 How Much Space Can a 10000 BTU Air Conditioner Cool? A 10,000 BTU air conditioner will be able to effectively operate within an area of 400-450 sq. ft. Make sure you know the exact size of the area you’re cooling, as anything bigger or even smaller can severely decrease the lifespan of your unit. How Many Watts Does a 10000 BTU Air Conditioner Use? Your average and most modern 10,000 BTU air conditioner can operate with a power consumption of around 1100 Watts. How Much Does it Cost to Run a 10000 BTU Air Conditioner? Typically, to run a 10,000 BTU window AC for at least six hours per day at the average wattage consumption, you’d be looking at around $100.40 per month. This also depends on some variables and things like how energy efficient your unit is.